This morning I had a small birding accident. I didn’t hurt myself – or anyone or anything else. This week the forecast is for severe hot weather after a prolonged period of mild weather, so I decided before breakfast that our bird baths should be replenished every morning. The resident birds sure appreciate the fresh water every day. I filled a handy bucket from the rainwater tap – I prefer to treat them to rainwater rather than tap water – and trundled outside into the garden. As I carried the very full bucket of water I stepped off the veranda and… disaster! The cheap plastic bucket shattered into about a dozen pieces and water splashed all over my shoes, socks, and legs. The bucket – what was left of it – was immediately thrown in the rubbish bin and another one fetched and filled from the tap over the laundry tub. This time the water reached its destination without further incident. My efforts were rewarded about an hour later. While reading the paper at the table in our sun room two birds flew in to have a drink and a bath. 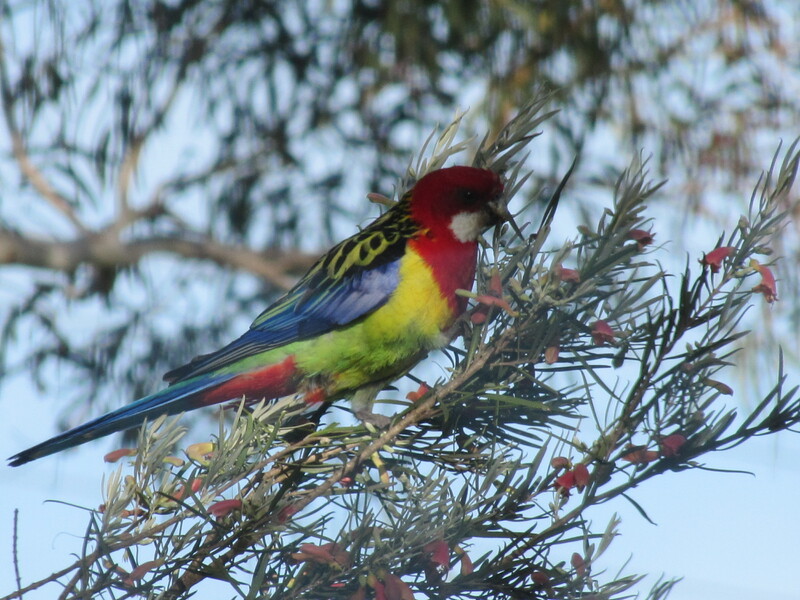 One was a Mallee Ringneck and the other an Eastern Rosella (see photo above) Strangely, these two birds have been seen together in our garden on many occasions over the last few years. Eastern rosellas are not common in this area.